The brain is exquisitely sensitive to changes in its oxygen supply. Indeed, oxygen delivery to the brain is regulated on a moment to moment basis. While the brain depends on oxygen for oxidative energy metabolism, there is also the danger of excess exposure to oxygen and the attendant problems of oxygen toxicity. Consequently, there must be mechanisms which regulate regional cerebral blood flow that optimize the contradictory requirements of energy demand and oxygen toxicity. Thus, regional blood flow is usually kept low so that brain tissue oxygen tension is low (Sick et al., 1982) to avoid toxicity until functional requirements produce increased neuronal activity which are accompanied by local increases in blood flow to accommodate the resultant increased energy demand (Kreisman et al., 1981; laManna et al., 1987). This hypothesis is a possible explanation for the paradoxical observations which indicate that the brain is always “on the brink” of hypoxia (Rosenthal et al., 1976) despite a demonstrable large reserve blood flew capacity. The mechanisms of local control of oxygen delivery seem to be set so that there is just sufficient oxygen for immediate energy demand but no more. 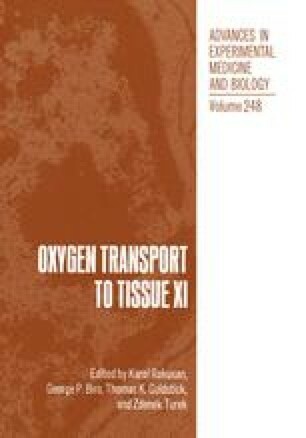 Hypoxic and hypoxemic conditions will obviously force a response from the regulatory mechanisms in order that the balance between oxygen delivery and consumption be maintained (LaManna et al., 1984).